In the wake of recent horrific and tragic events in Orlando, the need for inclusive dialogue, resources and support is greater than ever in our country and our community. We wanted to highlight a very few of the MANY great organizations and initiatives happening in Greater Richmond working to address tolerance, anti-violence, and promote diversity and inclusion. Formerly known as the Gay Community Center of Richmond, Diversity Richmond is dedicated to creating a permanent and sustainable non-profit structure in Richmond dedicated to serving the LGBTQ+ community, their families and allies – advocating for fairness, working collaboratively with and assisting others who share their vision. Since its inception, Diversity Richmond has distributed more than $850,000 to area non-profits organizations. Grant recipients use these funds to support programs that strengthen the LGBTQ+ community and, by extension, our full community. They also list a myriad of resources for the LGBTQ+ community on their website – including support group information, advocacy and legal resources, and even business/networking information – to name a few! Diversity Richmond is holding a vigil for the Orlando Victims on 6.14 at 6pm at Ginter Park Baptist Church. Virginia Center for Inclusive Communities works with schools, businesses, and communities to achieve success by addressing prejudices, in all forms, in order to improve academic achievement, increase workplace productivity, and enhance local trust. Through workshops, retreats, and customized programs that raise knowledge, motivation, and skills, VCIC develops leaders who work together to achieve success throughout the Commonwealth. VCIC started Standing Together RVA – a collaboration engaging the community to speak out and stand with marginalized religious and ethnic groups in order to advance respectful dialogue and promote inclusion. It was catalyzed in December 2015 in response to increased Islamophobia, xenophobia, and divisive rhetoric. The Richmond Peace Education Center works for a just and peaceful community by promoting nonviolence locally and globally. For more than 30 years, RPEC has served the community by providing educational programs that seek to reduce levels of violence, promote appreciation for diversity, and challenge and undo systems of violence and oppression in our community and world. RPEC runs a number of active programs, providing Conflict Resolution Training, the Richmond Youth Peace Project for teenagers (a collaboration with Drums No Guns) and public education about peaceful alternatives to war. RPEC’s programs reach thousands of people each year. See more of RPEC’s conflict trainings for youth and adults. 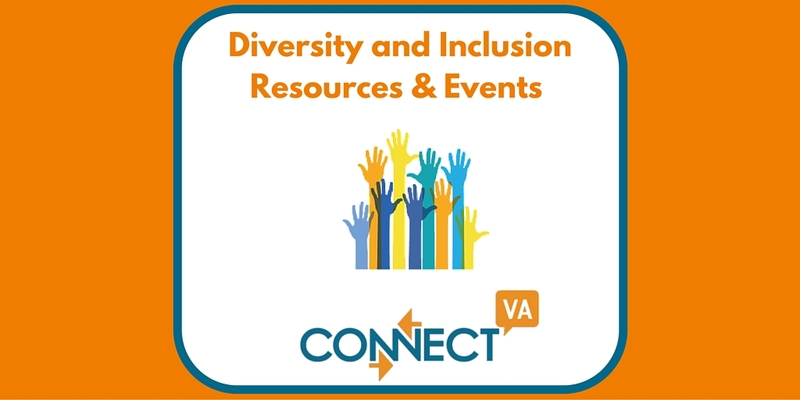 For more community events, trainings, workshops and collaborations happening in Greater Richmond related to Diversity and Inclusion visit our Event Calendar and Search the “Diversity and Inclusion” category. If you know of an event that should be added, feel free to contact us at admin@connectva.org for more instructions! Nonprofit Mobile App Contest Finalists →	← ConnectVA Spotlight: Ayo Abifarin, Culture4MyKids, Inc.